Where: At the beginning of and at entrances to any carriageway, lane or path. Purpose: To prohibit pedestrians from proceeding past this sign where they could cause a danger to themselves and to vehicles. Action:Despite the fact that pedestrians are prohibited on such a road, you must still look out for them. 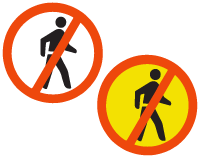 Pedestrians may not enter or cross a road where this sign is displayed.